John Wisden & Co Ltd.
Richie Benaud, who died this year, had it all and was the consummate professional. Cricketer, captain, journalist, radio and TV commentator par excellence, he must have been the envy of many as his reputation demonstrates. Benaud in Wisden, a collection of articles written both about and by him as well as match reports and career record, pays tribute to this wonderful man. Alan Davidson, one of Australia’s foremost cricketers, pays tribute in his Foreword to his former captain and friend. There are many memories of Benaud the cricketer, perhaps the first Tied Test and bowling Australia to an unlikely victory at Old Trafford in 1961 being the most memorable. 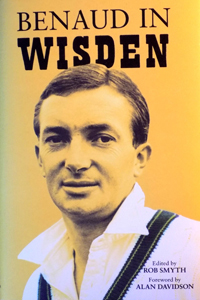 One of Wisden’s famous Five Cricketers of the Year, Richie also wrote about other similarly-recognised cricketers within the Cricketers’ Bible and these articles are published within this book. Other articles include the famous names of yesteryear and also discuss how he made his way into the media and the care and attention he paid into securing a position and, generously and modestly, how he made himself into the person he became. In an age where a lot of television coverage also includes a lot of commentary, Benaud was indeed legendary in knowing exactly what to say and when. Radio commentary, as many know, requires a different style. One day in July 2000, I was privileged to be scoring for the B.B.C at The Oval and saw none other than Richie Benaud in front of me. Lost, flustered and distinctly aware of the presence of the great man in front of me who was calm and collected, I thought that maybe I should put my head down and, wrongly, pretend that I had not seen him. His eyes followed me all the way and smiling, he said a cheery good morning. A wonderful moment. There are many one-liners which we will remember Richie Benaud by. “ That’s one for the memory” of a David Gower shot and the famous Botham shot at Headingley in 1981 which went “into the confectionary stall and out again” are but two memorable ones. One of his greatest traits was his impartiality, again not always something seen these days. It probably need not be stated that another of Wisden’s little yellow books is beautifully put together and presented under the expert guidance of editor Rob Smyth and that Benaud in Wisden is another one for the memory.